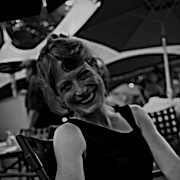 Kitty Jospé is a linguist and a poet who has moderated a popular weekly reading poetry appreciation session since 2008. She holds an MA in French Literature, 1984; an MFA, 2009, in creative writing/poetry; and has been a docent at the MAG since 1998 where in additions to tours, she has given talks linking musical elements of spoken language to visual patterns. She is an active collaborator with artists, dancers, musicians, and enjoys performing poetry. Her poems appear in such publications as Nimrod and Grasslimbs. She has published four books of poetry: Cadences, 2010; Mosaicq (Finishing Line Press semi-finalist), 2012; Gathering Lines, 2013; and Golden Smoke, 2015 (Foothills).